Developed by Natalie Rusk, research scientist in the Lifelong Kindergarten Group at the MIT Media Lab, the resource consists of illustrated activity cards that provide a playful entry point into Scratch, the graphical programming language used by millions of children around the world. 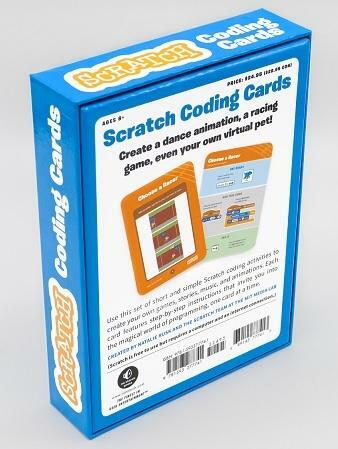 The cards make it easy for kids to learn how to create a variety of interactive projects, such as a racing game, an animated interactive story, a virtual pet and much more. Each card features step-by-step instructions for beginners to start coding. The front of the card shows an activity kids can do with Scratch, such as animating a character or keeping score in a game. The back shows how to snap together blocks of code to make the projects come to life. Along the way, kids learn key coding concepts, such as sequencing, conditionals and variables. Publisher No Starch Press recommends the coding activity cards for sharing among small groups in homes, schools and after-school programs.